Chrones Disease | Dr Joe McSweyn L.Ac. O.M.D. In 1987 I went to Japan to perform for four months. Three weeks into my stay there I became very Ill. I went to Japanese Doctors who temporarily made me better. For the following five years I had temporary bouts of stomach problems from a result of this. Finally in 1992 I was diagnosed with ameba disiteria and was put on a six week intensive drug therapy. After those six weeks the parasites were gone, but I felt worse. I was then diagnosed with crones disease, which is a chronic problem in most individuals. 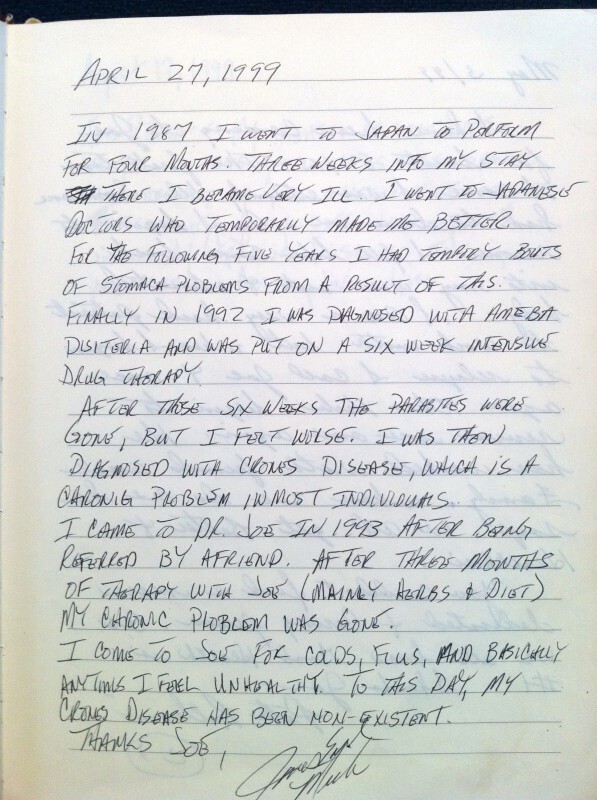 I came to Dr. Joe in 1993 after being referred by a friend. After three months of therapy with Joe (mainly herbs and diet) my chronic problem was gone. I come to Joe for colds, flus, and basically anytime I feel unhealthy. To this day, my crones disease has been non-existent.